Background checks are becoming more common, not only for creditors and landlords, but for employers and people looking for roommates or babysitters. 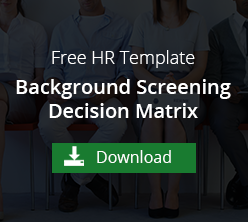 A background check can eliminate people who do not meet your set criteria. Perhaps you are an employer who requires your employees to use a company car. Obtaining a driving record is a critical piece in the employment process. By utilizing background checks, you are able to feel more confident that you are bringing a person into a situation that will work for everyone involved. Before performing a background check, you need to make sure you understand some of the basics behind a background check. Prior to running a check, you need to provide the proper disclosure and obtain authorization. The Federal Trade Commission (FTC) and Consumer Financial Protection Bureau (CFPB) requires authorization before running a tenant or employment background check on another person. This must be a stand-alone document, separate from the actual tenant / employment application. An employer, landlord or creditor must let the applicant know the background checks will be used in the decision-making process and provide the applicant with a copy of their Summary of Rights under the FCRA. The applicant must also be provided a written form (separate from the application) with a space for them to include their personal information, name, address, date of birth and social security number if required for the type of background check you wish to obtain. Make sure to list the type of checks you will be doing and include a statement that the information you obtain from the results will be used in the decision-making process. Have the applicant sign and date the authorization form. 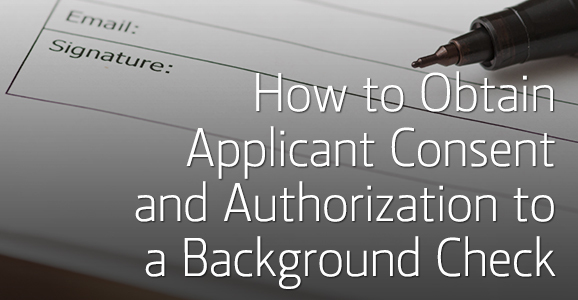 Keep the written authorization form within the applicant's file. This will ensure you have proper documentation showing you have authorization should the need arise later. Do not destroy this document. You may black out sensitive information such as the social security number if needed. After receiving the results from background check, review it to see if the applicant meets your requirements. In addition to allowing the applicant the opportunity to view the results, all employers, landlords, creditors, and insurers must give a copy of the document "A Summary of Your Rights Under the Fair Credit Reporting Act" before they are allowed to take any adverse actions against the applicant. The company information that supplied the background report. This must include the name, address and the phone number. A brief statement that shows the screening company did not make the adverse action decision and are unable to give the applicant any information on the decision made. A statement making the applicant aware that they have the right to dispute the information in the report or receive a free copy of the report from the screening company as long as it is requested within 60 days. Federal law requires compliance when obtaining background checks. Failure to get the applicants authorization or following the proper disclosures can result in legal consequences including lawsuits against you in both state and federal court. Before running background checks, make sure you are up to date with all applicable laws.